Argentina are assured of a place in the knockout round of the 2016 Olympic Games after their big win over Brazil in the last round of fixtures. There is still top spot in the group to play for, so they won’t be taking it too easy in this one but the fact that it took 2 periods of overtime to give Argentina the edge over Brazil may mean that the South American side aren’t quite at their best in this game. As for Spain, they could still end up getting knocked out of the tournament at this stage, so they could do with a win to remove that threat from the equation. It has been a difficult tournament for Spain and their poor start could still haunt them in this difficult match. Andrés Nocioni was the key player for Argentina in that win over Brazil, hitting 37 points while serving up 11 rebounds in the game. The fact that Nocioni plays his club basketball in Spain for Real Madrid will mean that he knows all about his opponents in this game and he’ll be desperate to do some damage for his country. Once again, Pau Gasol was the leading player for Spain, as he has been throughout the group stages, and he delivered 23 points in the big win over Lithuania. If Gasol delivers once again against Argentina, Spain will feel they have a good chance of securing their knockout round with a minimum of fuss and effort. The Spanish are favourites for this game and there are one or two signs that they are finally getting to their feet. By the time Spain start this game, they’ll know how essential a win is but even with that in mind, tip Spain at -8, which you can find at odds of 1.90. In the Over/Under market, you should go OVER 164.5 which you can find available at odds of 1.90 for this game. Bet Now! 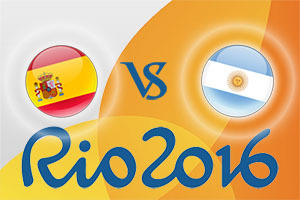 The Race to 20 Points bet sees Spain on offer at odds of 1.90 while if you are looking for a Spain half-time, Spain full time double result, you will find odds of 1.55. The game starts at 2300 BST on Monday 15th of August.